“Last Thursday, I had the privilege of attending the All Hallows’ School Final Year 12 Assembly. It was an emotion-filled gathering, and it was an honour to witness the genuine relationship shared between the senior students and teachers alike. As part of their final assembly, Mercy Community was presented with a cheque for the renovation of the Beemar Yumba kitchen in Cherbourg, along with other MC projects. 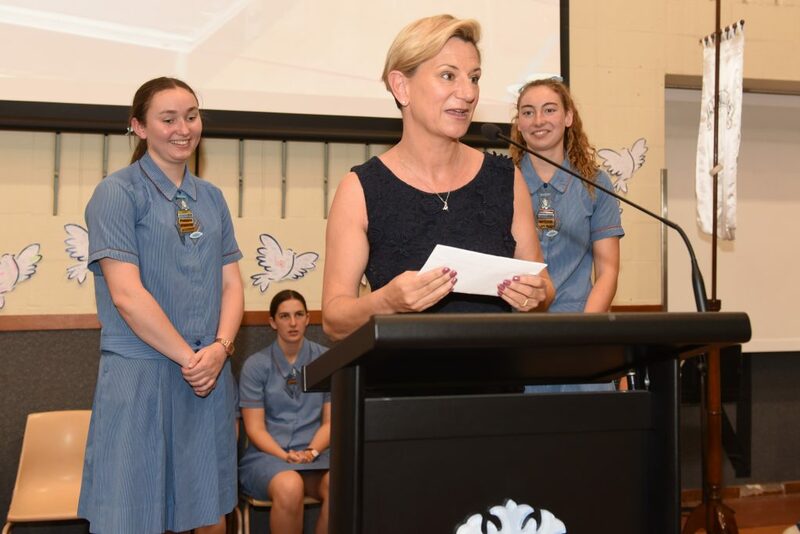 I was absolutely overwhelmed by the joy and energy displayed by the Year 12 cohort, and was moved that the students had chosen to incorporate this cheque presentation into their final assembly – a selfless act from unforgettable young ladies, with a true heart for social justice. As if I wasn’t overwhelmed enough, the girls then handed me a cheque for $30,000. I think the above image sums up my reaction to receiving the cheque quite accurately – a mixture of astonishment, disbelief and utter gratitude. I was speechless! The ladies raised this money throughout the year, across a wide range of fundraising events, dress-up days, sausage sizzles and food stalls. At their annual All Hallows’ School Fair, the students organised several fundraising activities, such as ‘Pat the Puppy’, a Haunted House, a jumping castle and ‘choc toss’. I am just blown away by this enormous donation and, on behalf of Mercy Community, extend my most sincere thanks to the All Hallows’ ladies. In addition, I want to thank the teaching staff for instilling a passion for social justice into this cohort. I truly believe that All Hallows’ School’s guidance and support has spurred a generation of young women to take social action far into the future, and the world is a better place as a result. This remarkable fundraising effort made by the All Hallows’ School girls once again highlights the incredible power of a unified vision and a passionate, determined team. There truly is no limit to the good we can do when we, as a team, are resolute in our mission to support and inspire people in need.